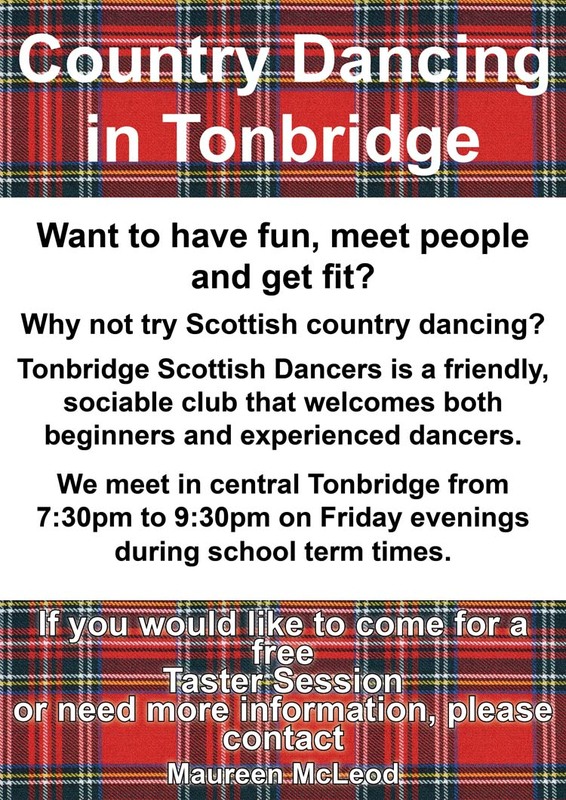 We offer you a warm welcome to Tonbridge Scottish Dancers (TSD). Click here to open the Minicrib sheets for the tea dance in .docx format. Click here to open the Minicrib sheets for the tea dance in .pdf format. The club began in 2006, having emerged from an adult education class. •	Our focus is on Scottish Country Dancing, primarily at a beginners’ level. A core of members has acquired several years experience. •	Whilst learning is important, members enjoy the friendly atmosphere and sharing in social activities. •	The club is open to people aged from 16 years upwards. The age range of current members is from mid-20s to mid-70s. •	We are always looking for opportunities to increase the number of members and to broaden the age and gender mix. •	Weekly attendances are usually enough for at least a couple of sets. Tonbridge Scottish Dancers hold events throughout the year, future events can be found on the Diary page of the KASS website. •	Members subscribe by the term or half term. •	In addition, we welcome visitors and those who come for a free taster session. Please arrange in advance. •	Meetings are at St. Stephen’s Church Community Centre, Waterloo Road, Tonbridge, Kent, TN9 2SW. •	Parking is free in the evening at the public car park immediately adjacent to St Stephen's Church, in a public car park, on the roadside and in side streets. However, if you find it difficult to find a space, then make for Sainsbury's car park, which is large and free after 6pm. From the church go to the end of Waterloo Road, by the railway station. Turn left and go past the station to a roundabout. Turn right (3rd exit) at the roundabout, then first left at a mini-roundabout, immediately right then left to enter the car park. It is a five minute walk back to the church.